B2B video marketing has become a channel of communication that can’t be ignored anymore. The 2016 B2B marketing trends report said that videos have an effectiveness rating of 62%, which was more than e-newsletters and blogs. This means that videos are more likely to generate engagement and possible leads than text campaigns. If that’s not convincing, check out “How to Get Your B2B Video Content Program Started.” The general overview and statistics should remove any other doubts. This post will explain the foundational steps that are crucial to creating an effective B2B marketing video. Begin with a focused purpose, define your target audience, and establish your distribution channels. 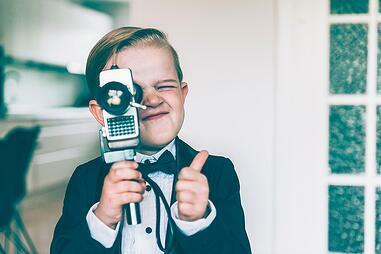 A lack of focus plagues the majority of ineffective B2B videos. Before starting your video, bring together a team to pinpoint the purpose of the video. First decide what stage of the customer buyer’s journey you want the video to address. Will it primarily spotlight brand awareness or prospective customers already interested in your product or service? Maybe the intent is remarketing to those prospects that have already visited your company’s website, but haven’t made a decision. Knowing where a potential customer is on his or her journey will dramatically help you set goals for your video. When it comes to that, consider using SMART goals for each video. If you are not familiar with SMART, it stands for Specific, Measurable, Achievable, Relevant, and Time-bound. Having hyper-focused goals will help you set benchmarks for your videos so you can create solid reports on their performance and return on investment (ROI). It’s important to spend time deciding who you are targeting for each video you create. If you don’t have a buyer persona for your target audience, then now would be a good time to create one. A buyer persona should include the demographics, behaviors, and motivations of your ideal customer. Try to interview a current client to get insight. You want your customers to feel like you are talking to them directly. Once you have a grasp on your target audience and a purpose for the video, then you should consider where you want the video to be shown. Remember, just because your company has a presence on multiple online and social media platforms that can post video doesn’t mean you should use them all. If you spent enough time defining your target audience, then choosing channels will be easy. For example, what if you found out that your target audience is primarily on Vine? That dictates where you should post your video. The more details and questions you can answer before you start creating your B2B marketing video, the fewer headaches and challenges you will run into later. Determining your purpose, the right target audience and the right distribution channels will guarantee a better video before you even shoot a single frame. Make sure to subscribe to our blog to get the latest tips for B2B marketing, and let us know how we can help you succeed.